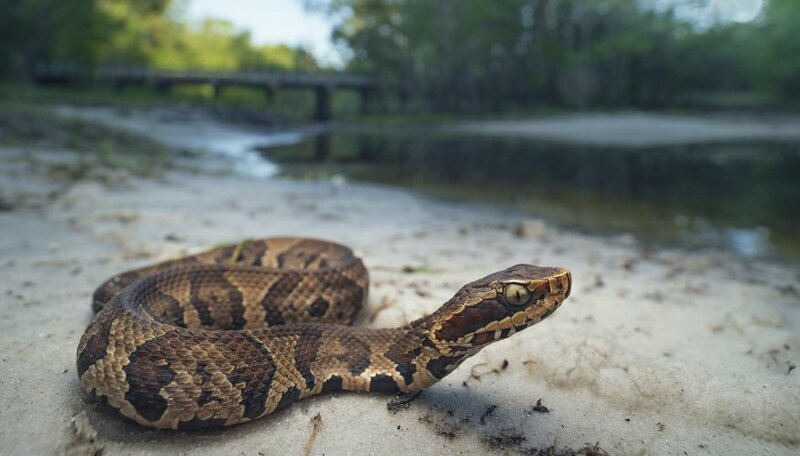 The problem with identifying a water moccasin, commonly called a cottonmouth, begins with the simple fact that most snakes can swim – even western rattlesnakes. In the southeastern states and along portions of the southern Atlantic coast, where climates are humid, and water is plentiful in rivers, lakes, ponds and streams, water snakes of all kinds and types thrive. Even though water moccasins are poisonous, they are not as aggressive as the venomous snakes found in India, Africa and elsewhere in the world. Most water moccasins prefer to avoid humans and only attack when threatened or happened upon accidentally. Identifying water moccasins means more than just knowing what they look like because in nature, there are always exceptions to every rule. It helps to know where they live, their identifying features, habitats, diet, breeding and living habits, as well as their life cycle. The quick and easy way to identify a water moccasin is to look for its wedge-shaped, blocky head (from above, as in a boat, you can't see its eyes), check for the heat-sensing slits beneath and between its eyes and nose, and note its olive, dark tan, dark brown or an almost black body, thick and python-like in its girth, especially in the middle before it tapers to a long, thin tip. Threatened water moccasins coil their thick bodies, vibrating their tails and opening their mouths wide to scare you away. The inside of the water moccasin's mouth appears white like cotton, which earned the creature its common name: cottonmouth. Venomous snakes like the water moccasin may coil when threatened because this gives them an advantage in that they have a farther reach if they need to strike. They can also try to make themselves look bigger by flattening their bodies out and coiling a bit near the head. When their wide, white mouths are open and gaping, they make hissing sounds. The cottonmouth does not have the most toxic venom in the United States as that honor belongs to the Eastern diamondback rattlesnake. On average, snakes bite about 7,000 to 8,000 people per year, resulting in only about five fatalities. Nature provides exceptions to every rule, and when subspecies breed, variations in color and identifying features can change. For the most part, among the three subspecies, identifying features are similar with few differences. The Florida water moccasin_,_ the western water moccasin and the eastern water moccasin grow to an adult size from 8 to 48 inches long, with a record length of 74 1/2 inches long. The snakes are thick and dark colored, with a heavy body, with the neck smaller than the body and with the tail tip long and thin. A juvenile water moccasin appears brightly colored with red-brown bands that extend across its back and down its sides without crossing the belly, set against a brown body color. Many of the crossbands on the snake's back can contain dark spots and flecks. As the snake ages, these patterns darken so that adults retain little of their original banding, hinted at in the background of their almost black bodies. Keeled scales cover their body, with raised ridges running lengthwise in the center of the scale. Because of their keeled scales, water moccasins do not appear shiny, but instead appear dull with a non-reflective surface. Across the eyes of the Florida water moccasin, you can spot a broad and dark facial stripe – not defined as well in the eastern water moccasin – which can camouflage the eyes. At the tip of the Florida cottonmouth's snout, look for two vertical dark lines, which don't appear on the eastern cottonmouth. If you look at the snake's head when it's flat on the ground or from above, you can't see its eyes. Large, plate-like scales cover the top of the head, and a deep facial pit – used for sensing body heat emitted by prey – occurs right between the nostril and the eye. The head has a flat, wedge-shaped appearance typical of all pit vipers (venomous snakes), almost triangular, with its widest place right at the jaw because of how wide it can open its mouth. Very young cottonmouths have yellow-colored tails they hold upright and wiggle to lure prey within striking range. As the snake ages, the tail turns black. Water moccasins or cottonmouths present as three species. Distributed across Florida, the Florida cottonmouth has a native range that includes the upper Florida Keys and parts of extreme southeastern Georgia. The eastern cottonmouth ranges from the Carolinas and Georgia to southeastern Virginia. The western cottonmouth has the largest range in that it lives in eastern Texas, Oklahoma, eastern Cherokee County in Kansas, Louisiana, Arkansas, southern Missouri, western Tennessee and even the extreme southern regions of Indiana and Illinois, as well as Mississippi, western Kentucky and Alabama. According to the U.S. Geological Survey website, water moccasins appear not to have crossed the Rio Grande into Mexico, while most distinct populations in the Rio Grande areas of Texas don't exist anymore due to them being rooted out or destroyed. Cottonmouths include intergrades – connections or breeding between the three subspecies – living in a region that encompasses Alabama, Mississippi, Georgia, South Carolina and the western part of the Florida panhandle. Intergrade species may make it harder to identify cottonmouths because of variations that occur in coloring and other characteristics. Even though the water moccasin hasn't crossed the Rio Grande into Mexico, the snake has made its way into other areas of the country. The primary reason people may find water moccasins outside their native ranges is primarily because of introduction into the area by people. In 1965, a farmer in Boulder, Colorado, introduced a water moccasin into the areas around his land to help scare off fisherman. A cottonmouth specimen found in Massachusetts in 1986 probably showed up in the state because someone freed a "pet" water moccasin, or it escaped into the region from captivity. In 1965, someone introduced water moccasins into Montgomery County in Kansas intentionally, but they are now gone. It is not known whether the water moccasin colonies found in Livingston County, Missouri, in 1941 arrived there naturally or if someone introduced them. But by 1987, all the water moccasin colonies in Livingston County were rooted out. At this point in time, no natural colonies exist north of the Missouri River, according to the U.S. Geological Survey. Snakes are sneaky and will hide anywhere that makes them feel safe, like the case of the water moccasin discovered between the outer and inner hulls of a barge in Winona, Minnesota, in 2006. The snake probably hitched a ride from Baton Rouge, Louisiana, where the barge began its journey. The preserved specimen permanently resides at the Bell Museum of Natural History in Minnesota as listed in the non-indigenous species database maintained by USGS. While cottonmouths do not require water to live, they prefer to live near freshwater habitats because of the foods they consume. The most common of these habitats include thick, vegetated wetlands, marshes, bogs, cypress swamps, river floodplains, overgrown ponds and other areas where amphibious creatures live. Sometimes cottonmouths travel overland where people find them far from permanent water sources. During droughts, cottonmouths may assemble close to drying wetland pools to feed on trapped fish, amphibians and even other cottonmouths. Because cottonmouths live in the southeastern regions of the United States, you can even find them in the sunny days of winter basking on a log, rock or low-lying branches near where their amphibious prey congregates. Snakes found in higher branches are more than likely non-poisonous water snakes, as cottonmouths prefer the lower branches. Though they're out in both day or night, they primarily hunt for food after dark when there's hot weather. When they hunt for food they either wait quietly or actively forage, like when they swim underwater to catch fish and frogs. Not picky eaters like other snakes, cottonmouths consume a wide range of animals: mice, lizards, salamanders, alligators, other snakes, fish, turtles, eggs, birds, mammals, frogs, tadpoles and meats of all types. As opportunistic eaters, water moccasins will mostly eat any type of carrion they can wrap their mouths around. Mating season occurs in the early part of the summer, anywhere from April to early June, when males go head-to-head in combat for females. Males perform a "combat" dance where they slide from side to side while waving their tails in hopes of luring the females away from other males. As ovoviviparous reptiles, like all pit vipers, water moccasins give birth to live young once every two to three years because the females incubate their eggs inside their bodies. Female litters can contain anywhere from one to 20 live snakes that are roughly 7 to almost 13 inches long. Bright yellow, sulfur-colored tips distinguish juvenile water moccasins. Gestation or pregnancy lasts between five to six months. In captivity, water moccasins live up to 24 1/2 years. Since the number of non-poisonous water snake species outnumber water moccasins, it's easy to confuse the two snakes because of similarities in coloring and habitats. The easiest way to identify the water moccasin from a non-venomous water snake is to check its head. Water snakes have long tapered heads that blend seamlessly into their bodies – and there are no heat-sensing pits below and between the eyes and the nose. All pit vipers, water moccasins included, have a distinctively wedge-shaped triangular head and much smaller necks than their heads. Water snakes prefer resting in the higher branches of trees near the water's edge while water moccasins prefer being closer to the water to take advantage of their prey. Water snakes differ from water moccasins in that the water snakes immediately bolt when threatened, even going underwater. Water moccasins stand their ground, gaping their wide mouths to discourage predators. Most water moccasins seldom bite when threatened, unless stepped on or picked up, and if given enough space, will turn and leave. When you see a snake in the water, but only its head is showing, it is more than likely not a water moccasin or other poisonous snake. When non-poisonous water snakes stop swimming to examine their surroundings, their bodies slip beneath the water. When a poisonous snake like the cottonmouth rests on the water, its body stays afloat. Water moccasins prefer to lounge on old logs, rocks or low branches near the water's edge. When water moccasins go on the hunt for their amphibious food, they do swim underwater to capture it and they can even bite underwater, as opposed to the myths that say they don't. Brenner, Laurie. "How to Identify a Water Moccasin." Sciencing, https://sciencing.com/identify-water-moccasin-5091302.html. 10 August 2018.